Struggling Charlton have suffered a new blow with the news that skipper Luke Young will be sidelined for six weeks. The 27-year-old defender damaged knee ligaments in Saturday's demoralising 3-0 defeat to Liverpool. "Luke is the captain. 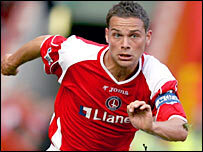 He has got a great reputation and is very influential with the players," said Charlton boss Les Reed. "He'll be a big miss for us. Hopefully he will still be in around the dressing room trying to gee the lads up." Saturday's defeat followed an embarrassing 5-1 thrashing by Tottenham, leaving the Addicks are five points from Premiership safety. Charlton play Wycombe at the Valley on Tuesday in the Carling Cup quarter-finals and Reed believes success could help him attract new players to the club in the January transfer window. "Certainly when we are trying to attract players we will have to throw everything in the pot," said Reed. "So if we are successful it is a good selling point."